Elise Christie's return to speed skating ended in an early exit for the British mixed relay team at the opening World Cup event of the season. The short-track quartet finished third in their heat behind the Netherlands and Russia in Calgary, Canada. The new 2,000m event was Christie's first since the Winter Olympics in Pyeongchang, where she fell or was disqualified in all three of her races. 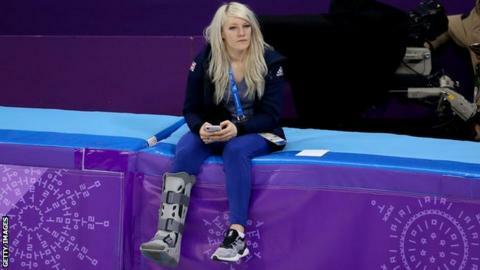 Christie, 28, injured her ankle ligaments in the 1500m in February. The Scot had previously fallen in the 500m final and was disqualified from the 1,000m heats. In a post on Instagram before the mixed relay event, the three-time world champion said the focus was to "rehab my body and brain". "Having only started full training not long ago I'm focused on knuckling down and getting back to my best self," she added. Britain's Kathryn Thomson finished second in her heat to qualify for the women's 500m quarter-finals. The event is the first of five World Cup events, which run from November to February 2019.